It has been the essential for me, always. When you freak out, water is must. Plus exams are mostly in summers. This bottle is something that I loved. My dad got it at Bangalore Airport. It's a normal plastic bottle, but I loved the design. And the water inside appears magically tasty and pure. A Tommy Hilfiger wallet. It was my brother's, earlier. But I took it from him, as he got a new one from my dad. (I always like using his things.) 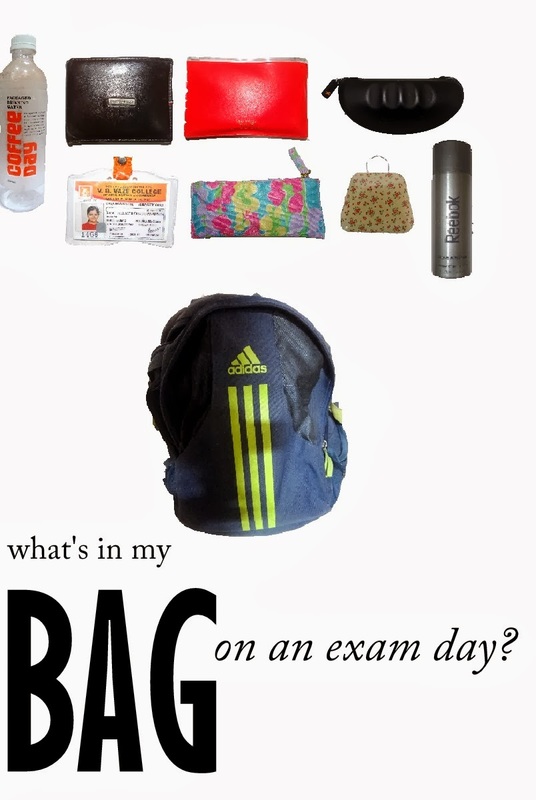 Wallet is a must to carry, which is obvious, but during exams, it's even more! You need money for emergencies, like if your train is late, you can go by auto-rickshaw or a cab. I put cash, college library cards, train pass and my blog's so-called visiting card inside. (Sorry about the shabby white boxes, but I had to rub off my details.) Without ID Cards, entry to the college itself is not allowed. So I see to it that I don't remove it from my bag any time. I use this zipper pencil pouch to keep my exam supplies inside. I keep pencils, pens, eraser, ruler and sharpener in it. I use this cute pouch by Lilly Pulitzer (designed for Estee Lauder) to keep my headphones, keys, pen drive and USB chord (sometimes). This tote I carry to keep the coins inside. I don't know since when I started carrying deodorants to college. I'm not that type of a girl who carries comb, makeup and similar things to college, or anywhere! Still, seriously I don't know how, but I started carrying a bottle of deodorant. It's a pretty thin bottle, so it's great to keep inside my little backpack. My college mates gifted me this Reebok bottle on my 19th birthday, along with another deodorant. The fragrance it has, is sooo refreshing. Finally Adidas backpack. This little backpack is something that I haven't seen with anyone. It's very unique. I love the colors on it. Not lot of things fit inside it, but most of the things do. So I use it whenever I have a lesser amount of things to carry. What things do you carry to your exam?